How do people become involved in the fascinating business of tropical fish keeping? For such a popular hobby, it gets surprisingly little coverage in the media. It's also quite complicated to set up, and it can be expensive, so it requires a serious commitment from the start. How does that passion for aquaria develop? How do people acquire the knowledge they need to make a tropical aquarium work? We spoke to Stuart Neil, an aquarium enthusiast from Glasgow, to ask him how he got started and what his tropical fish mean to him. "I've been keeping fish for five or six years now," Stuart says. He explains that he worked in a pet shop to support himself whilst he was a student, and there he "got into the fish keeping side of things", developing an interest in different species and learning how it all works. He was soon hooked. Having seen something of how tricky keeping healthy fish can be, Stuart was initially modest in his ambitions. "I thought I'd like to try having my own tank, so I started out with a small 60 litre tank, which I've still got set up - it's in my daughter's room now." Early success made him bolder, and he has since moved on to a 180 litre main tank. "I've got two discus, I've got a black ghost knife fish, a black sail fin molly, three black widow tetras, two blue cobalt gourami a flame red gourami, two Congo tetra, one neon tetra, three clown loaches, one striped barb and two zebra loaches - and two pepper corydoras," he says of this tank. It's a complicated set-up. The tank looks beautiful, but does keeping so many different fish together work? "They all get along fine," he reports. "The discus are a wee bit quiet - they stay away from the rest of the fish and the rest of the fish stay away from them - but there's not any violence in the tank or anything." A successful community tank like this can be hard to put together but is very rewarding when it works. Loaches are friendly towards almost any fish whilst barbs, tetra and gourami will often shoal together. But which of these fish are Stuart's favourites? "My discus. Definitely my discus. They're pretty rare and they're cracking looking fish... I'm not sure what kind they are, but they're bright blue." 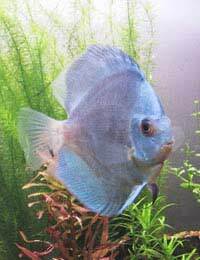 These turn out to be blue diamond discus, fish which are generally much loved by their owners. They're often sensitive fish with problems socialising, but their intelligence and their distinctive personalities are very endearing. As a rule, they do well in pairs, in a tank of their own or when sharing with other fish.